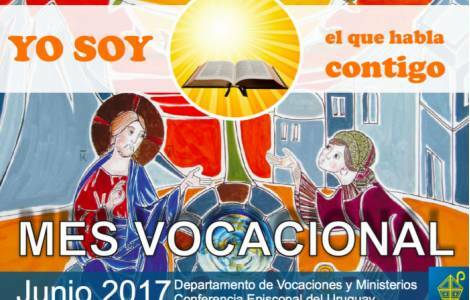 Montevideo (Agenzia Fides) - "I am the one who speaks to you" is the theme with which the Church in Uruguay is celebrating the month of June "Vocational Month". According to the note sent to Fides by the Bishops' Conference of Uruguay, the initiative was decided by the Bishops during their Plenary Assembly in November 2007 to respond to a proposal by the Confederation of Religious men and women of Uruguay. All the dioceses of the country are thus united in this pastoral commitment, trying to help each person find their place in life according to the plan God has for each of us. "Vocations are commonly referred to as vocations to priesthood or to religious life, priests or nuns, but vocation means much more than this", underlines Don Mauro Fernández. "Vocation first and foremost, is a call to life", he says. "Another point is the call to love. "Then each of us will have to adapt to his reality and ask himself 'What does God want from my life? What is God's plan for me?'"